This directory contains an implementation of an End-to-End Memory Network for goal oriented dialogue in TensorFlow. Goal oriented dialogue is a subset of open-domain dialogue where an automated agent has a specific goal for the outcome of the interaction. At a high level, the system needs to understand a user request and complete a related task with a clear goal within a limited number of dialog turns. This task could be making a restaurant reservation, placing an order, setting a timer, or many of the digital personal assistant tasks. End-to-End Memory Networks are generic semi-recurrent neural networks which allow for a bank of external memories to be read from and used during execution. They can be used in place of traditional slot-filling algorithms to accomplish goal oriented dialogue tasks without the need for expensive hand-labeled dialogue data. End-to-End Memory Networks have also been shown to be useful for Question-Answering and information retrieval tasks. nlp_architect/data/babi_dialog.py: Data loader class to download data if not present and perform preprocessing. 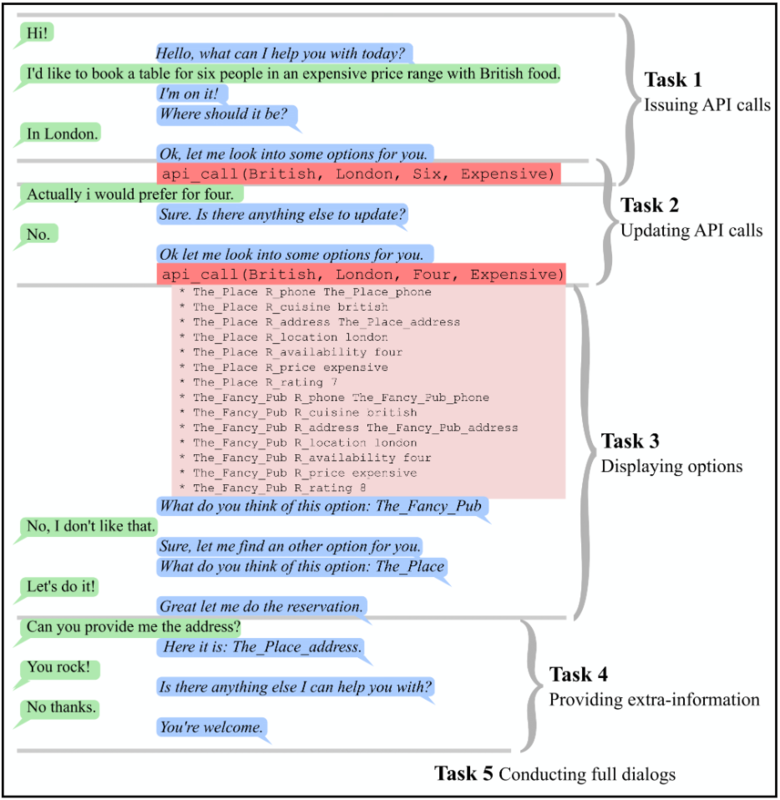 nlp_architect/models/memn2n_dialogue.py: Implementation of MemN2N_Dialog class for dialogue tasks. examples/memn2n_dialog/train_model.py: Training script to load dataset and train memory network. examples/memn2n_dialog/interactive.py: Inference script to run interactive session with a trained goal oriented dialog agent. examples/memn2n_dialog/interactive_utils.py: Utilities to support interactive mode and simulate backend database. The dataset used for training and evaluation is under the umbrella of the Facebook bAbI dialog tasks (https://research.fb.com/downloads/babi/, License: https://github.com/facebook/bAbI-tasks/blob/master/LICENSE.md). The terms and conditions of the data set license apply. Intel does not grant any rights to the data files. The dataset is automatically downloaded if not found, and the preprocessing all happens at the beginning of training. There are six separate tasks, tasks 1 through 5 are from simulated conversations between a customer and a restaurant booking bot (created by Facebook), and task 6 is more realistic natural language restaurant booking conversations as part of the dialog state tracking challenge. The flag --use_match_type can also be used to enable match type features (for improved out-of-vocab performance but slower training). Otherwise, the interactive mode operates as a chat bot, responding to dialog to assist with restaurant booking. Vocabulary of the model is limited, please use the vocab command to see what the model actually understands. The model was trained and evaluated on the 6 bAbI Dialog tasks with the following results.